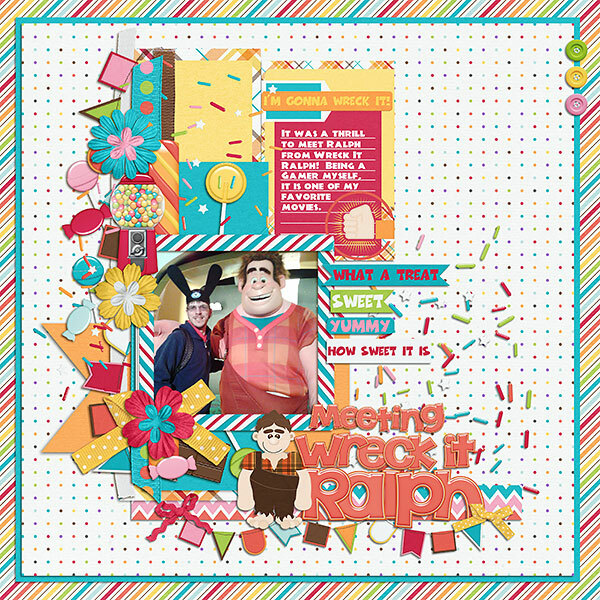 Scrap Out Loud: Sweet Candy by Kellybell Designs! 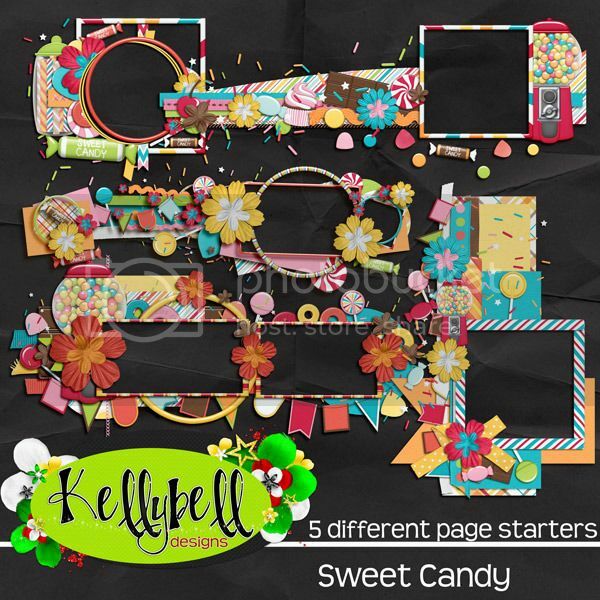 Sweet Candy by Kellybell Designs! I'm Gonna Wreck It! Have you seen the movie Wreck It Ralph? It's an adorable movie all about video game characters inside a cart racing game in the candy town called Sugar Rush. 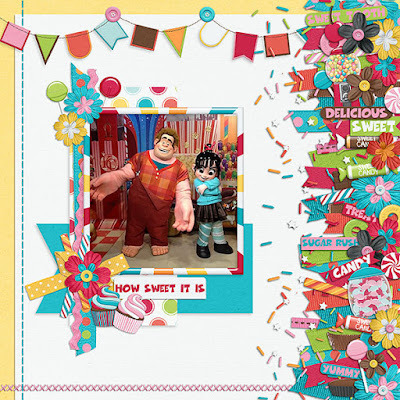 The scenes are filled with mounds of candy, chocolate volcanoes, lollipop signs, gum drop mountains and cotton candy clouds. It's heavenly sweet! Kelly's collection today is filled to the brim with candy. This kit has so many uses. You can scrap your meet and greet photos with Ralph and Vanellope, shopping excursions at Goofy's Candy Company, pictures from the queue at Toy Story Mania or snack pictures at the park. So many possibilities! Inside the Sweet Candy kit, you'll find several delicious elements including lollipops, ice cream bars, punching fists, cupcakes, popsicles, gumball machines, ribbons, cherry, suckers, flowers, gumdrops, candy jars, cookie, chocolate bar, candy sticks, peanut butter cup, life savers, tootsie rolls, ice cream cone, lots of word tags and best of all - a Ralph and Vanellope doll. There's also 15 papers in playful colors and patterns along with a bright red orange full alpha. You might also like the set of 5 page starters filled with amazing clustered frames. How about a cool word art pack with super sweet titles? Kelly also has 6 journal cards that are perfect for writing some notes about your trip. All this makes you hungry for a snack, huh? You can find all these yummy goodies inside the Kellybell Designs Store. This weekend only they are priced at 25% off so grab them up now! Ready for a few freebies? You can find 3 amazing treats made by Kelly's Creative Team gals at Jennifer's Blog, Julie's Blog and Jenn's Blog. Give the girls a candy kiss for thanks! Have a great weekend and happy scrapping!